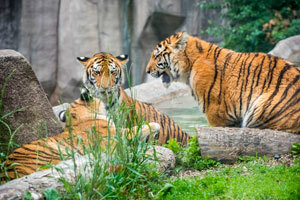 Tiger Cubs Turn 1 Year Old! We are thrilled to celebrate the birthdays of our three special Amur tiger cubs, Bernadette, Eloise and Kash on Sept. 14! Our tiger cubs have grown tremendously in just one year. All three cubs were born weighing less than 7 pounds each. Now, one year later, Kash weighs over 200 pounds, and both girls weigh around 170 pounds. It is hard to believe that these big cubs are the same cubs who were born at the MCZ just one short year ago! Multiple servings of beef and horse meat each day (6 pounds for the girls and 7 pounds for Kash) have allowed for the tiger cubs to grow into teens. The tiger cubs love to splash and play in the water. The tiger cubs love to stay active and play in the water. Eloise, Kash and Bernadette all love splashing around in pools and rain, as well as playing with water from the hose. Personalities of the three have grown vastly in one year. Kash is a goofy boy who loves to snuggle with his sisters, when they let him… Kash is good at listening to his sister’s directions and is a sweet cub. Bernadette can be described as a spitfire, who does not get bossed around by anyone. She is the smallest of the three, but it is hard to tell, as she is the cub in charge. Once shy, Bernadette is now active and enjoys joining in on games with her brother and sister. Eloise, who used to be the chubbiest out of all the cubs, is now tall, long and lean. She is the more playful of the two girls and can usually be found causing trouble with Kash. Our tiger cubs are out for the public to see every day. Come watch Kash, Bernadette and Eloise grow, play and splash around in the water!